February is not a good month for RMT market. After the 3rd week, in-game currency price for most games in our RMT Roundup list started to drop. 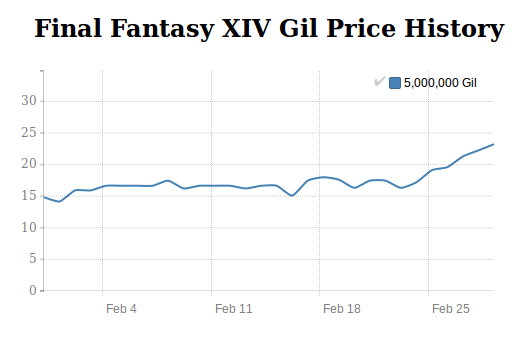 FFXIV is the only different since its Gil price was significantly going up because of the latest update called “Gear of Change”. Guild Wars 2 gold price was very fluctuated and had a dramatic decline of more than 50%. Gold price for Blade and Soul now became stable after its release on the NA/EU market in January. Surprisingly, the average ArcheAge gold price was even lower in February than in January. The upcoming patch 2.5 update Bloodsong suddenly became very silent and did not have any related update at all in February. Trion did not add any new features to the game but only a few bug fixes. Although ArcheAge gold price had been changed for almost every day, its discrepancy was even only around 10%. Price in March should be only slightly lower unless we hear something related the “Bloodsong” again. The cheapest Archege gold was on February 27, 2016, which is 2,000 ArcheAge gold for (US) $29.99 and the most expensive was on February 29, 2016, for $34.60. The different rate was only at 13.37%. EVE Onine ISK prise has been rising continuously in February because of its upcoming events called EVE FANFEST 2016. It is by far the biggest event for EVE Online every year gathering ten thousands of EVE gamers from around the globe. Developer talks, cosplay, exciting activities, and game updates will be seen here in the event. And this time it’s going to be EVE Citadel coming with several new exciting features. And this time it will be held in Iceland on April 21-26. EVE Online ISK price is expected to increase slightly in March from this event. The cheapest was on February 21, 2016, which is 2bn EVE ISK for $35.00 and the most expensive was on February 28, 2016 for $36.00. It was as minimal as 2.86% different. Unlike FFXIV, Guild Wars 2 Gold did not have much effect at all from the recent update. 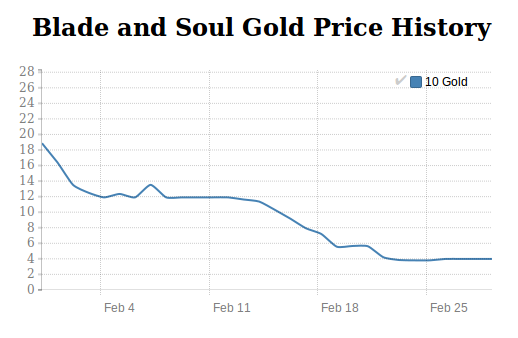 On the other hand, GW2 Gold price had been remained the same since the beginning of the month. On the 3rd week, it became unknowingly fluctuated till the end of February. This is a bad sign for the game itself. Guild Wars 2 is losing a popularity causing the in-game currency price to be lower every month. It’s expected that Guild Wars 2 Gold price is going to be even lower in March. 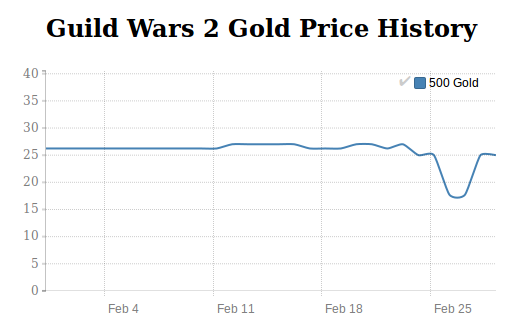 The cheapest was on February 27, 2016 which is 200 GW2 gold for $17.72 and the most expensive was on February 21, 2016 for $27.01. The sudden fluctuation rate was as high as 52.43%. The effect of the Star Wars film was gone on the third week of February causing SWTOR credits price to be, once again, on a dramatic decline. Although there was a big update called “Knights of the Fallen Empire” this month, it didn't help anything in RMT market. SWTOR Credits price should be lower again and might even reach its lowest point in history in March. The cheapest was on February 29, 2016 which is 10mn SWTOR US Credits for $19.98 and the most expensive was on February 14, 2016 for $28.57. The declined rate was as significant as 42.99%. Tera started the month with a marketing promotional by making a 50% discount on all DLC packs. It seems to be going well since Tera Gold price became higher in February. And it kept staying in the same range throughout the month. However, this kind of price increase should only last for a few weeks. Tera gold price is expected to be lower again in March. The cheapest was on February 01, 2016 which is 20,000 Tera Gold for $22.24 and the most expensive was on February 04, 2016 for $25.98. It was 16.82% different. February is quite a rough month for WildStar. It had been fluctuated throughout the month with almost 30% decrease in price as predicted in our January RMT Roundup. And it even has a chance to be lower again in March. However, the developer team still not give up on the game as they are planning to add a lot more contents in 2016 including the upcoming Destination Arcterra. Let's see if it going to have an impact on RMT price or not. The cheapest was on February 23, 2016 which is 5,000 gold for $34.95 and the most expensive was on February 7, 2016 for $45.09. The declined rate is as high as 29.01%. World of Warcraft had been enjoying its high gold price for the first two weeks in February and started to decrease again after that. One main cause of this decrease is there was not a single update related to “Legion”, the upcoming expansion to the World of Warcraft in this month. Unless there's an interesting news regarding this again in March, WoW gold price should still be decreasing. The cheapest was on February 26, 2016 which is 50,000 gold for $22.42 and the most expensive was on February 09, 2016 for $24.95. The discrepancy rate was 11.28%.